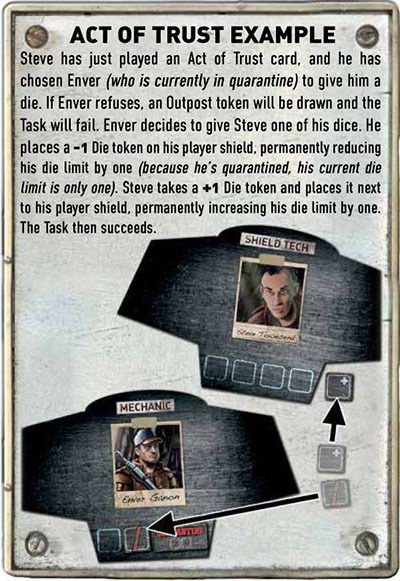 At the start, each player (Uninfected and Infected who have not yet revealed) places a -1 Die token (the side with the slash through it) on their player shield, reducing their die limit by one. This does not affect revealed Infected players. If the Final Event is successfully completed, the Uninfected team does not automatically win. The Commander must reveal their Status card; if they were secretly Infected, the Infected team wins. Likewise, the Infected team wins if the Commander is Fatigued when the Final Event is completed. Note: This Final Event can provide some incredibly tense moments as players jockey for control of the Commander card. However, if all Infected are revealed before the Final Event occurs, this card will result in a very anti- climactic game. No vote is held. The Commander simply chooses to release someone from quarantine or to place someone in quarantine. If all Infected players have reveaeled and no one is currently in quarantine, the Commander must still place a player in quarantine. In a five player game, for example, if there are five or fewer Strong dice on the Available Resources spot, they cannot be retrieved by the players. 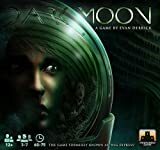 This may mean that some players will not be able to retrieve dice at all at the beginning of their turn or when passing. This does NOT affect revealed Infected players. They may retrieve Strong dice as usual. If a player attempts a REPAIR action, they may only roll red Weak dice. If a player does not have any active Weak dice, trying to perform a repair is pointless. Revealed Infected players do not get to retrieve dice when this Event is completed. If the Outpost token for Command is on the board when this Event is completed, it does NOT affect the number of dice players are allowed to retrieve. They may still retrieve dice up to their full die limit. Per the wording on the card, the Commander MAY remove all of one kind of Damage token from the board. The Commander is not obligated to remove any Damage tokens, however. Upon completion, note the number of Outpost and Fatigue tokens on the board. Then, shuffle all Outpost and Fatigue tokens together facedown and draw new ones (making sure you have the same number that you began with). New actions may be blocked, players who were Fatigued may no longer be so, and players who were not previously Fatigued may find themselves suddenly Fatigued. Place all possible Damage tokens on the board BEFORE testing the shields (if any of the three Damage tokens would end the game, do NOT place them). If, when testing the shield, the Failure Condition is met, requiring either a Fatigue or Outpost token to be drawn, the game can end because of this additional Damage token. The Commander cannot cause the game to end (this may mean that fewer than five Damage tokens are Drawn). If this card is played, drawing a Damage token is not optional. Therefore, this card will always result in a successful Task. If the chosen player agrees, they place a -1 Die token (the side with the slash through it) on their player shield, reducing their die limit by one. The player who played the card places a +1 Die token (the side with the + on it) next to their player shield, increasing their die limit by one. The active player may choose themselves to receive the Commander card. The Commander may play this card themselves and choose another player to give the Commander card to. The active player may choose themselves to be voted on. If this card is played, drawing Damage tokens is not optional. Therefore, this card will always result in a successful Task. The two Damage tokens that are drawn may be different kinds. Whenever retrieving dice, Jon must observe his die limit. Normally, Jon will retrieve up to three dice when passing. If the Command Outpost token is on the board, he will retrieve two dice, one fewer than he normally retrieves. 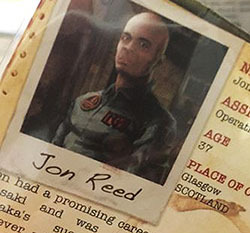 Jon does not retrieve an extra die under any other circumstance (for example, from an ISSUE ORDER action that has been given to him). Jon is one of the only characters who's ability is always in effect, not just when he is the active player. When she is the active player, Luba may reroll all of her dice once, rather than submit one. This could be when attempting a REPAIR action or during a Malfunction Task. For example, during a Malfunction Task Luba rolls a -2, -2, and -1. Normally, she would need to submit at least one of those dice. Instead, she chooses to use her once-per-turn special ability and reroll all of her dice rather than submit a negative die to the board. Since she can only use her ability once, she will have to submit at least one die regardless of what comes up on her reroll. Luba canoot choose to simply stop rolling. If she doesn't like a given roll she has the option to reroll, but once she's rolled her dice she will ultimately need to submit at least one.